As real estate owners and industry professionals, we understand the importance of regular maintenance, property insurance, and other routine tasks designed to preserve the value of what is, for many of us, our most significant asset -- our real estate. One thing that often escapes our attention, though, is a routine examination of the public records. Recent stories in Texas, Illinois, Pennsylvania, Ohio, and Florida tell us about people from every walk of life who were shocked to discover that they no longer owned real estate they thought was theirs. Whether it is a family home, a business, a vacation property, or anything else, we expect our land to stay in our control until we decide to transfer it. On the surface, it is counter-intuitive to think that a person can simply record a deed and steal our property, but similar scams are occurring with increasing regularity across the country. How can this kind of theft happen? Purchases of real estate involve dealing with numerous regulations and signing forms that require proof of identity. This process is intended to ensure valid transfers and to preserve clear chains of title. For honest purchasers, the requirements may feel like unnecessary hoops to jump through; for criminals, they provide an opportunity to cheat unwary property owners. Valid conveyances require that the executed deed be delivered to and accepted by the grantee. Because actual (hand-to-hand) delivery is not always possible, most states also allow constructive delivery, wherein an acknowledged and recorded deed presumes prima facie evidence of due delivery. The delivery requirement exists to ensure that the grantee knows about the transfer of ownership as well as the associated responsibilities such as taxes and maintenance. Recording the deed, while not expressly required by law in every state, is an important factor in securing interests in real estate. Entering ownership changes into the public record serves as constructive notice to future buyers, who should research the chain of title prior to purchasing property. Black's Law Dictionary defines forgery as the "act of fraudulently making a false document or altering a real one to be used as if genuine." It is a criminal offense in the US, designated as either a felony or a high-degree misdemeanor. In some states, the charges depend on the details of the crime, including the dollar amount and/or the nature of the document; forging real estate deeds generally leads to a higher-level offense. Many fraudulent deeds contain one or more forged details. The grantor or an authorized representative must sign all real property deeds, so a "false document" may be a new transfer with a non-authentic signature. A signer may pose as the property owner and sign the deed in front of a notary. Others may use a completely made-up name or identify themselves as the owner's personal representative. Seemingly legitimate deeds become another kind of false document if the forger first executes and files a deed wherein he/she signs as the actual property owner or personal representative and conveys the title to him/herself. Once the records are changed, the fraudulent grantor sells the property to an innocent third party. These transactions often involve quitclaim deeds, which offer no warranties of title. Altering an original, valid document is another kind of forgery. A criminal might gain access to a property owner's actual deed, often by intimidation, misinformation, or outright theft. Depending on the individual state's rules on correcting recorded documents, it might be possible to change some non-material details on the original deed and re-record it with the updated (but fraudulent) information. Forgery brings other issues, too. When deeds containing forged or otherwise fraudulent information enter the public record, they perpetuate this junk data. This causes additional problems because numerous people and businesses access this information every day for real estate purchases, mortgages, title research, credit checks, and so forth. The role of public real estate records Among other things, public land records verify real estate holdings. They confirm the existence of ownership claims by identifying boundaries, locations, and the chain of title. They also provide evidence of liens, easements, or other claims associated with the property. The amount and type of data contained within these records has changed over the years, largely in response to concerns about identity theft. To comply with requirements designed to protect personally identifiable information such as social security numbers and dates of birth, those details can often be redacted from previously recorded documents and not included on new forms submitted for recording. The introduction of electronic documents and e-recording, as well as digital preservation and storage, are further attempts to strike a balance between privacy and availability. Online access to recorded documents and their images varies widely. Some jurisdictions require registration or subscriptions for any remote viewing. Others only provide names and property addresses for each transaction, and some recorders choose to make the full repository searchable. Even with protections in place, public records are often the first place criminals look when they prepare falsified documents. Plus, the basic information used in deed forgery is likely to remain available: the parties' names and the property address, and often, the tax parcel ID and legal description. Accessible public records are a necessary part of our legal landscape; we depend on their security and accuracy. Because deeds and other instruments relating to transfer of real property require notarization prior to recording, it makes sense to view notaries and recorders as gatekeepers -- notaries can refuse to acknowledge a document if they believe its signature is forged or otherwise inauthentic, and recorders can refuse to accept documents without proper acknowledgement. These rejections should prevent at least some criminal acts, protect legitimate property rights, and help to maintain the overall integrity of the records. Anyone can fall victim to crimes associated with deed forgery -- even financial professionals like a Chicago city treasurer. We are all at risk, but specific factors make some kinds of property and/or groups of people more attractive to criminals. Unoccupied, abandoned, or distressed homes, lots, or businesses are easy targets for fraudsters. If you have multiple real estate holdings, make a habit of visiting each one regularly, at unpredictable times. Keep all properties in the best possible condition. Pay attention to homes owned by deceased friends or relatives. Criminals watch the death notices and can act quickly to steal the property by forging the name of the decedent on a deed, then recording the document in an attempt to secure title. Senior citizens, immigrants, and those facing foreclosure or other financial difficulties are also at risk. These groups are often perceived as vulnerable by scammers who try to bully or confuse them into signing away their rights. In particular, criminals found guilty of defrauding seniors of their homes are also frequently convicted of elder abuse, which adds additional penalties. 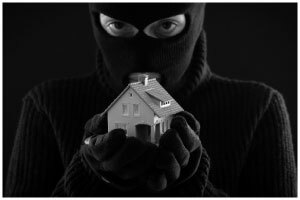 Understand who and what faces the highest degree of risk for deed-related crimes. Reduce obvious signs of neglect and take the time to check on those who might be more likely to fall prey to scams. This increased awareness can put members of targeted groups on notice, and encourage more aggressive preventative actions. Advice for victims If you become a victim of deed forgery or its associated crimes, all is not lost. Take control of the situation by knowing your rights, pressing charges, and actively following up on any resulting investigation. Report the theft to local law enforcement IMMEDIATELY. Depending on the location, police might be unwilling to investigate the crime, so be prepared to call county or state officials, too. If the property is situated in a different municipality than your primary residence or place of business, contact your area's authorities as well. Remember, forgery is a criminal offense in the US, so if nothing else works, contact the FBI. Gather all relevant documents (deeds, mortgages, insurance policies, etc.) to provide a starting point. In fact, why wait for an emergency? Organize this information today and store it in one accessible location. This way, if the police need additional documentation for your case, you will be able to provide it quickly. Alert the recorder for the county where the property is located. There might be procedures in place to help you. Some counties have established real estate fraud units to focus on this problem. A Chicago-area woman's quick response saved her property when she caught the thief in the midst of changing the locks on her front door! She contacted the recorder's fraud unit, who reviewed the property's chain of title, saw the potential crime, and brought in the police. Even if the recorder's office is unable to help you directly, bringing the crime to their attention might stop the scammer from victimizing others. Contact an attorney who specializes in real estate law. If you cannot afford legal counsel, call the state or local bar association for the names of attorneys who might help you at a reduced fee. The lawyer should be able to help identify the nature of the fraud (void or voidable) and to initiate actions to protect or regain your interest in the property. House flipping is a legitimate investment plan in which distressed properties are purchased for a low price, quickly repaired, and resold. Plenty of these transactions are legal, but they make use of quick turnovers, which do not leave much time for title searches. As such, it is an attractive scheme for fraudsters. Properties used in house flipping scams may be sold at prices that are either unusually high or unusually low for the local market; criminal involvement in house flipping tends to involve fraudulent appraisals and target unused or abandoned houses. The deeds may also contain forged signatures in order to sell the property to a third party. House stealing involves many of the same characteristics of house flipping. The FBI discusses several scenarios for house stealing, all of which include deed forgery and identity theft. After identifying a likely property, (most often abandoned or unoccupied, but sometimes with residents still living inside!) the scammers, posing as the owners, sign deeds transferring ownership into their names (or their fake names). Or, the criminals may claim to be personal representatives of the estate of a deceased owner, or refer to non-existent powers of attorney. Then, at least on paper, they have rights to the property and can sell, rent, or otherwise abuse it at will. These transactions often use quitclaim deeds and may not require a mortgage, so they are unlikely to involve title insurance. In addition to deed forgery and identity theft, house flipping and house stealing can also include other crimes, including elder abuse, property theft, tax fraud, and mortgage fraud. Forged deeds can also be a component of a mortgage fraud. As with house stealing, the FBI is actively working to educate vulnerable homeowners about this type of real estate crime. They define mortgage fraud as "a material misstatement, misrepresentation, or omission relied upon by an underwriter or lender to fund, purchase, or insure a loan. There are two types of Mortgage Fraud: fraud for property and fraud for profit. Fraud for Property, also known as Fraud for Housing, usually involves the borrower as the perpetrator on a single loan... Fraud for Profit involves industry professionals. There are generally multiple loan transactions with several financial institutions involved." If there is still an outstanding mortgage on the real estate, recording a transfer might trigger a "due on sale" clause if/when the lender receives notice. Alternately, the fraudulent owners could apply for a new first or second mortgage on the property, take the money, and never make a payment. In addition to forgery, mortgage fraud might include other criminal acts, such as identity theft, property theft, tax fraud, mail fraud, wire fraud, and elder abuse. In addition to the crimes perpetrated against the primary homeowners, others suffer losses from deed fraud, too. What happens to bona fide purchasers of real property that turns out to be stolen? Depending on the type of deed and the nature of the fraud, they might end up with nothing but an expensive lesson. Deed forgery is an increasingly common problem. The methods may vary, but the net outcome is the same: loss of property. We have three primary lines of defense against it: notaries, recorders, and owners. Each of these groups plays a role in protecting our property rights, but the most important tools for everyone are diligence and responsiveness.